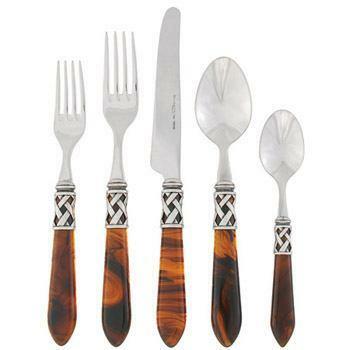 6.5"L - 9.5"L The Aladdin antique 5-piece place setting in tortoiseshell features elegant pearlized handles with the strength of high-grade acrylic and 18/10 stainless steel. One of our most popular colors! Dishwasher safe, please use the low energy/air dry cycle, with handles up in the basket. You can also purchase individual place setting pieces, please call VIETRI for prices.